The Lemon shark (Negaprion brevirostris) commonly named for its yellow brownish color, is more respected for its size that for its reputation. This giant of the seas measures 11.50ft and 400 lbs. 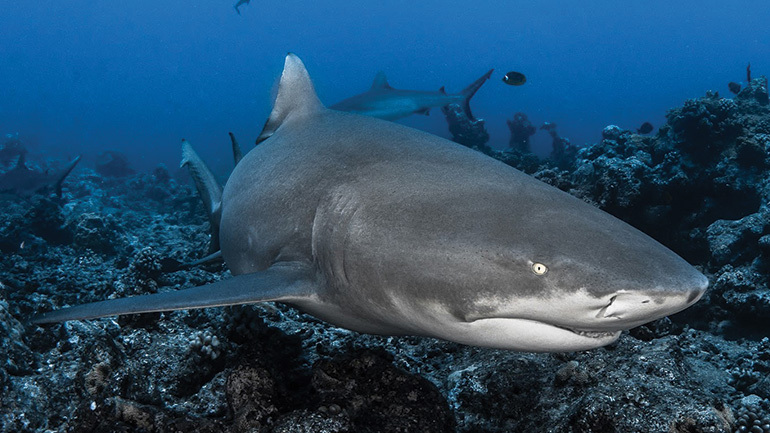 Under the misconception that the lemon shark is a dangerous animal, it is rarely aggressive and every diver that encounters it is more awed than anxious by its presence. This shark can be observed in French Polynesia, in the west coast of Africa and in the region of Indonesia. Lemon sharkIts yellow colour covering its abdomen when young brought it the name of lemon shark. It is characterized by a short nose; big eyes in the shape of a lemon and a meandering swimming motion with its mouth open proudly exhibiting its thick jaws. It two identical dorsal fins are a unique trait of this species. The lemon shark is a solitary animal, although it is commonly observed in groups of 3 or 5 sharks. The lemon shark is particularly fond of oceanic slopes which they consider their perfect hunting ground. It can be observed in deeper water between 230 to 300 feet. Quite territorial, the lemon shark claims an area of 3300.000 square feet. During its mating season the lemon shark complete very large distances . Its diet is made up of fish, rays, mollusks, crustaceans and sometimes birds. It is active during the day and night unlike its cousin the Nurse shark. The Lemon shark can live up to 40 years. Females have a gestation period of 12 months after which they give birth to 3 to 13 little sharks. In spite of this potential of reproduction, the lemon shark is today an endangered species. 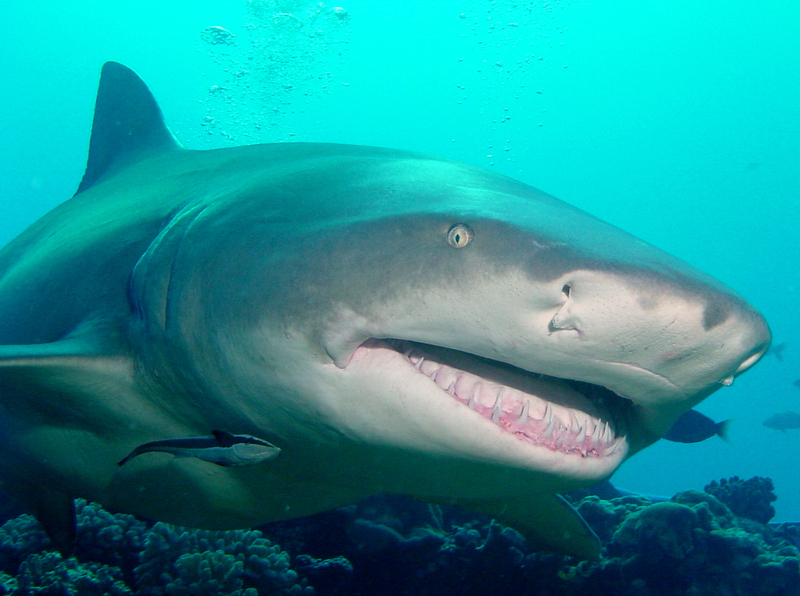 Since 2006, the Polynesian government has decided to declare the lemon shark as a protected species. In French Polynesia, you’ll have the chance of encountering the lemon on the divesites of the “Opunohu canyons” in Moorea, the “White valley” in Tahiti and “Tapu” in Bora Bora.